Pneumatic components used in “extreme” temperature applications require a different design mindset. SMC has products that are specifically designed to be used in high temperature and low temperature applications. Pilot operated valves with metal seals and base mounted or body ported type manifolds. Base mounted manifolds are available in plug-in and non plug-in styles. Body ported manifolds are available with bar or separate type manifold bases. SMC offers Direct Operated Solenoid Valve in 3 port, 4 port, 5 port. 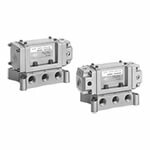 Direct acting solenoid valve provides high speed, lightweight and high flow performance. The valve will operate at pressures from 0 psi to rated maximum pressure and can be configured as stand alone or in manifold base. Air operated valves are available in body ported or base mounted styles. Many air operated valves use the same manifolds as series solenoid types. SMC mechanical valves have been designed to meet general industry standards and are capable of long, trouble-free life under stringent operating conditions. The CQ2 compact cylinder is the world's best selling pneumatic cylinder and is supported globally. The CQ2 is available in 15 bore sizes from 12mm to 200mm. It comes standard with male or female piston rod threads. 42 standard options make it one of the most versatile cylinder series on the market. For mounting flexibility, it is possible to mount auto switches on any of the 4 surfaces. Available in four bore size options, series CJP2 includes a tiny, but powerful, 4mm bore size option making it the smallest double acting pin cylinder around. 6, 10 and 16mm bore sizes complete the range, all featuring extruded aluminium bodies, making them not only compact, but extremely light weight. Series CJP2 is auto switch capable and other options include rubber bumper cushions, and made to order models including both heat and cold resistant types. Mounting possibilities include basic/panel, flange, foot, clevis and trunnion options. Series CJ2 with temperature options are small bore, double acting, single rod, stainless steel tube, air cylinders available in 6, 10, 16mm sizes and designed for extreme temperatures. Available in 7 mounting types for versatility. Series CM2-Z stainless steel cylinders with temperature options offer the same compact, lightweight and high performance as the standard CM2-Z. The piston seal and rod seal design provides excellent life. The CM2-Z series delivers extra flexibility including the option of male and female rods. Where space is at a premium, you can select a female rod end (up to 29 mm shorter) and/or boss-cut type (up to 16 mm shorter). Rubber bumpers are standard. The CM2-Z series offers a variety of mounting options. The NCG series is an extremely durable, repairable round body cylinder that provides precision mounting, short overall length, light weight and high speed. Rubber bumpers are standard with an option for adjustable air cushion. Nine mounting styles are available for cylinder mounting flexibility. Bore sizes for the NCG range from 3/4"(20mm) to 2 1/2" (63mm). Standard available stroke lengths from 1" to 12" but with the ability for long strokes. The NCG series is auto-switch capable. The NCG is capable of speeds up to 40 in/sec. The NCG series is available in 11 standard options to help fit into many different applications. The series CU single rod, double acting free mount cylinder saves space and allows direct and precise mounting. It is available in 6mm to 32mm bore sizes with stroke lengths up to 50mm. Options include auto-switch capabilities, free mount choices, recessed switch mounting grooves and rubber bumpers standard. Series NCM stainless steel cylinder offers space savings, high performance, and interchangeability with other stainless steel cylinders. A wear ring extends the seal life and a bronze rod bushing is standard on all bore sizes. The NCM is available in 3 mounting styles (front nose, double end, and rear pivot). The C85-XB7 series low temperature, single rod, double acting, conforms to ISO 6432 and CETOP RP52P. The C85 is available in bore sizes 8mm through 25mm. Series C96 cylinders conform to ISO 15552. The series is available with a single or double rod in 6 bore sizes from ø32 to ø125mm. High accuracy covers and tie rod nuts improve mounting accuracy and extend the cylinder life. Increasing the precision of the bushing and piston rod, as well as reducing tolerances, has decreased the deflection of the piston rod. Standard strokes range from 25 to 800mm. The MXP high precision slide tables have travelling parallelism of 0.004 mm for all its bore sizes and non-rotating accuracy +/-0.03° for 6, 8, 10 mm bore siszes and non-rotating accuracy +/-0.04° for 12, 16 mm bore sizes. Its actuator body and guide block are made from Martensitic stainless steel for high rigidity and integrated to guide rails for isolating the load bearing from the movement of the piston rod and seals. SMC offers one of the most extensive lines of pneumatic grippers (air grippers) in the industry today. The series include pneumatic rotary grippers, two, three and four finger parallel styles that are ideal for gripping and centering; a wide opening parallel model, designed to accommodate many different sized parts; a heavy duty style, suitable for a wide range of applications; an angular model, speed adjustment built in; a toggle to give reliable gripping support; a low-contamination style, equipped with a protective boot; and electric models. This combination Filter/ Regulator minimizes space and piping by integrating the 2 units into one. Standard features include a relieving regulator, which can be quickly locked by pushing down on the adjustment knob. There are many options, which include gauges, auto-drain, metal bowl and covers, different set pressures, etc. Series AF modular style air filter is a cost effective, clean looking solution to your filtration needs. Its' modular design allows connection with other SMC air preparation equipment. AL series lubricators are available in several configurations to provide lubrication to your equipment. Modular models are available to connect directly to filter and regulator units to create a single air preparation module for a machine. Stand-alone micro mist and high flow lubricators can be used to meet more demanding or higher volume needs. All feature simple adjustability and easy maintenance. Filter regulator series prevents moisture and dust in the compressed air line while maintaining pressure at a stable level, in spite of variations of both air consumption and air source pressure. Lightweight, compact, and precision control make these speed controls the right choice for many heavy-duty applications. These speed controls are offered with in-line and elbow construction to give the widest choice to your unique application. Locking nuts are included as standard as well as simplified mounting. Insert fittings are suitable for use with nylon, soft nylon and polyurethane types of tubing. The insert mechanism provides reliable retaining force on both sides of the tube (inside and outside). The KF series can used for a wide range of pressures from vacuum up to a pressure of 1.0MPa. SMC manufactures Fluoro-resin tubing for use in environments involving high temperatures and/or corrosive fluids. Pneumatic tubing is also available in a number of other materials both with and without reinforcement for use in standard applications. SMC fittings incorporate a positive tube seal while the fitting is under pressure which allows polyurethane tubing to be used. SMC's CG5-S series is a stainless steel cylinder, perfect for use in wash down applications such as food processing machinery requiring intense cleaning. The use of non-toxic additives allows confident use in equipment for foods, beverages and medical products, etc. The CG5-S can be disassembled, allowing replacement of seals, which promotes an extended service life. SMC provides plugs for unused mounting threads to prevent residue build-up in the threads. The use of stainless steel (SUS304) on external metal parts provides improved corrosion resistance in environments with exposure to water. Series CA2 with high temperature resistant options are double acting, single rod version of the standard CA2 rod air cylinder. The CA2 is available in 40, 50, 63, 80 and 100 bore sizes and is RoHS compliant. The MGPM High Temperature Option is a compact body actuator integrated with internal guide shafts to isolate the load bearing from the movement of the actuator's rod and seals. The carbon steel alloy slide bearing provides lateral stability protecting it from side load impacts, suitable for stopping applications. The CY3B Rodless Cylinder - Magnetically Coupled uses industrial strength magnets located in the piston and external carriage to form a single unit that will travel when actuated with air pressure. The CY3B series has resin based lube retainers installed on the dust seal to more evenly distribute lubricant for a reduction in minimum operating pressure. 70% longer wear rings will distribute a side load over a larger contact area for improved bearing performance. Please note the CY3B must be used with an external guide to support the load. The CXS Series is a dual piston actuator with non-rotating accuracy ± 0.1°. The CXSL high precision ball bushing type allows for smooth operation that ensures stable travel resistance. The CXSM slide bearing type provides lateral stability protecting it from side load impacts. The MHZ2 Series gripper has an integrated linear guide for high rigidity, positioned with two dowel pins to prevent guide slippage. It has mounitng versatility on three sides, in five configurations. The finger opening angle ranges from 30° to -10° making the MHC2 suitable for workpieces of odd shapes and where space is too tight to accommodate a parallel type gripper. Designed for applications that require a wide range of travel for gripping many different sized workpieces; the MHL2 Series finger motion is synchronized by a rack-and-pinion mechanism. The double piston construction creates a compact gripper with a large holding force. Vacuum ports, copper fluorine and silicon free options available. SMC offers a variety of auto switches for actuators and air grippers. Reed and solid state switches are available in a general purpose type or with 2-color indication, which allows the optimum operating position to be determined by the color of the light.